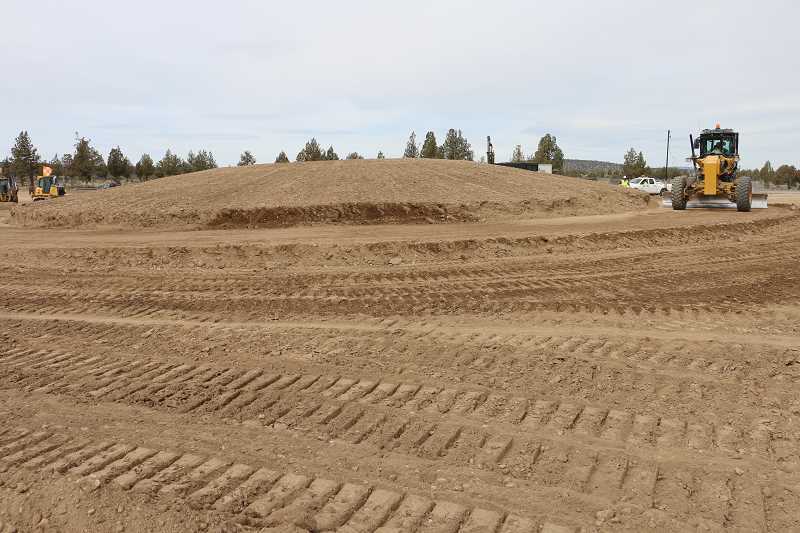 The Tom McCall/Highway 126 roundabout is taking shape as evidenced by the dirt form that now greets motorists in and out of Prineville. Finished is the first phase of the project, construction of Aviation Boulevard, a detour road that diverts Tom McCall Road traffic away from the roundabout construction site and to Airport Road to the west, which connects back to the highway. Now, work is well under way on the roundabout structure itself. "We want to get rock on it — that will be the next stage," said ODOT spokesman Peter Murphy. "Smooth it out, get it into its final form and then rock it. Then, after the rock goes down and gets smoothed out, we start paving." The rock will be added during the next week, and construction crews will also complete some grind and paving work on Airport Way. The road work is scheduled for night hours, so Murphy said delays should be minimal. Bend-based Alex Hodge Construction began the $4.9 million roundabout project in late January. The roundabout was chosen as the optimal upgrade option to the Tom McCall Road intersection with Highway 126, which has grown much busier in recent years with the additions of the Facebook and Apple data centers as well as other industrial businesses in the area. ODOT officials and city and county leaders considered multiple ways to safely move increased traffic through the intersection, including a traffic light, but determined the roundabout would keep traffic moving while preventing the possibility of high-speed vehicle crashes. The roundabout will be built to accommodate trucks as long as 130 feet. It will follow rural design guidelines and focus on improving turning movements and reducing travel speeds prior to vehicles entering the roundabout. It will transition drivers from highway speeds to an entry speed of approximately 25 miles per hour, where they will yield to conflicting vehicles. Once completed, the roundabout will be the second largest single-lane design to accommodate highway caliber traffic in Oregon. The project includes an oversized truck bypass and new connections to Airport Road to the north and Pillar Road to the south. Work on the roundabout is scheduled to continue into the summer and fall, and construction is not expected to interrupt Highway 126 traffic until the project nears conclusion and contractors tie the highway into the new traffic structure. "Hopefully it won't be too disruptive," Murphy said. "We just need folks to have a little patience and understanding, and in the long run, it'll be much better." Although the project has a deadline date of Dec. 1, Murphy expects drivers to start using it sooner than that. "It looks like we will be done with the heavy lifting in the fall," he said. "In the early fall, people will start using it."